That's what caused the explosion? Time travel? It was CAUSED BY TIME TRAVEL THE WHOLE TIME? Worst. Storyli- wait. I was about to declare this the worst storyline ever, but then the Author would just follow it up with an even worse one. So let us just say "I do believe that the current storyline is somewhat less than splendid, my dear chap". 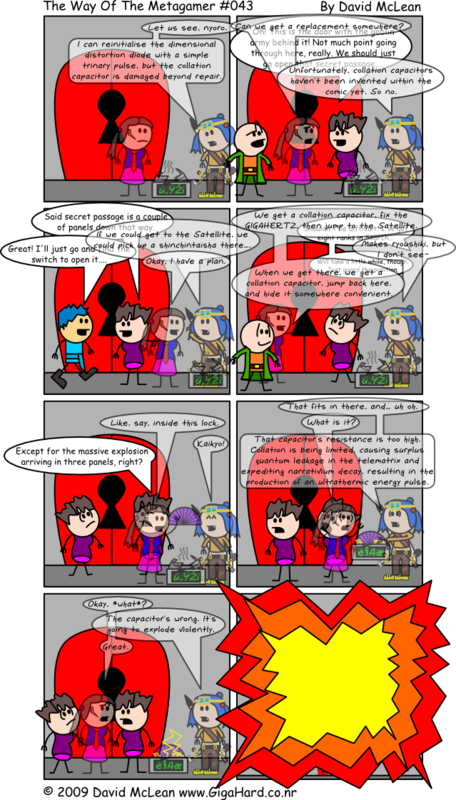 It hasn't got much to do with this particular comic, but it's an interesting observation: webcomics often have mechanics, the same way roleplaying games do. Terror Island has a tensed logic mechanic, for example; it also has its stunt-double rules, superpowers, etc. The Order of the Stick runs mostly on D&D mechanics, but still invokes many of its own, regarding the Rifts and such. I noted that WotM has a lot of mechanics: plot holes, predestination, past! and future! variants, desaturation and Colour Drops, all of the mechanics that are just planned and not actually introduced yet (these are numerous)… and that's not even getting into the whole meta concept. I think this webcomic may actually be better as a roleplaying game system. Which is crazy. HOW DID YOU GET ALL THAT FROM A THROWAWAY JOKE 13 MONTHS AGO? (That's a rhetorical question.) 5 stars all the way! Well done! Trope-tan: Let us see, nyoro. I can reinitialise the dimensional distortion diode with a simple trinary pulse, but the collation capacitor is damaged beyond repair. Jane: Can we get a replacement somewhere? Trope-tan: Unfortunately, collation capacitors haven't been invented within the comic yet. So no. Trope-tan: If we could get to the Satellite, we could pick up a shinchintaisha there…. Jane: Okay, I have a plan. Jane: We get a collation capacitor, fix the GIGAHERTZ, then jump to the Satellite. Jane: When we get there, we get a collation capacitor, jump back here, and hide it somewhere convenient. Jane: Like, say, inside this lock. Trope-tan: That fits in there, and… uh oh. Trope-tan: That capacitor's resistance is too high. Collation is being limited, causing surplus quantum leakage in the telematrix and expediting narrativium decay, resulting in the production of an ultrathermic energy pulse. Trope-tan: The capacitor's wrong. It's going to explode violently.